Big Montgomery's Ice Fort is the fourth level of World 5 in Yoshi's Woolly World. The level begins with a giant slide, leading to a door, which in turn leads to an area with a few Bumpties and Hook Guys. There are a few moving ice blocks afterwards, followed by some Monty Moles and Piranha Plants. A few more Bumpties appear, some flying, through many moving ice blocks to the door leading to the first checkpoint. More Bumpties follow, with some sliding down the ramps. Next, Yoshi will encounter ice blocks that crush towards the ceiling. After a few more Monty Moles and a Hook Guy, more "crushing" ice blocks appear along with the second checkpoint. Afterwards, Yoshi will enter a vertical segment of ice blocks behaving much like moving girders. This leads directly to the boss door. Smiley Flower 1: In a hidden alcove below the first Egg Block, Yoshi much touch an exclamation circle and collect all beads before time runs out to reveal the Smiley Flower. Smiley Flower 2: At the top left corner of the room before the first checkpoint, Yoshi must hit a Winged Cloud to revel a platform and enter a warp pipe. Inside the secret room, Yoshi must wait until the rotating ice blocks bring the Smiley Flower forward, then grab it and drop down. Smiley Flower 3: At the top left corner of the room after the first checkpoint, in a hidden alcove with a Bumpty. Smiley Flower 4: In a hidden alcove just below the path of the second "crushing" ice block. Smiley Flower 5: Behind an edible wall right next to a Bumpty-spawning warp pipe at the top left corner of the room just after the second checkpoint. Wonder Wool 1: Accessible from a green pipe in between two floating, rotating ice cubes. When encountering the warp pipe with the first Piranha Plant on it, Yoshi must defeat the Piranha Plant and enter the pipe. Inside the secret area, Yoshi must use the crevices of the ice blocks to collect the Wonder Wool. Wonder Wool 2: Just behind the Piranha Plant after the first Monty Mole. Wonder Wool 3: In the bottom right corner of the room before the first checkpoint, guarded by a Piranha Plant. 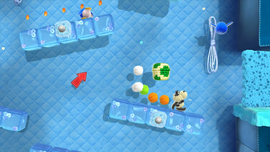 Wonder Wool 4: When approaching the Bumpty just before the second checkpoint, Yoshi must ride the next ice block upwards, then move to the right and enter a crevice in another ice block to the Wonder Wool. Wonder Wool 5: Unveiled after hitting a hidden Winged Cloud in between the two girder-like ice block platforms before the boss door. 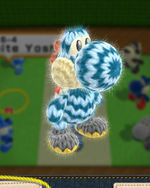 Collecting all of the Wonder Wools knits Frostbite Yoshi back together. This page was last edited on October 31, 2018, at 13:23.